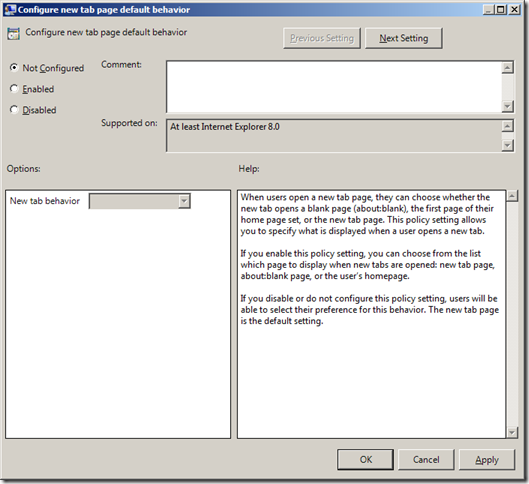 Microsoft have just released a hotfix (KB980959) to fix the problem with the “Configured new tab page default behaviour” group policy setting not working for Internet Explorer 8. Apparently the Intetres.admx had the wrong path configured path is configured to “Software\Policies\Microsoft\Internet Explorer\Main” where it should be configured to “Software\Microsoft\Internet Explorer\TabbedBrowsing\NewTabbedPageShow”. If you want to see the setting for your self just look for the text “NewTabAction” in the Inetres.admx file.